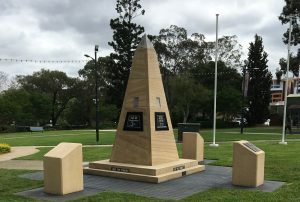 Lest We Forget: A new memorial honouring the Armistice Centenary and the sacrifices made by Australian servicemen and women will be unveiled tomorrow in Mawson Park, Campbelltown as part of a Remembrance Day commemoration. The Armistice Centenary Memorial will be unveiled tomorrow (Friday, November 9) during a Remembrance Day Commemorative Service for Schools called A Day to Remember, which will start from 10am. A Day to Remember will be held in the lead up to Remembrance Day on Sunday, November 11, which this year will carry additional meaning because it will mark a century since the guns fell silent on the Western Front. The memorials are part of the Federal Armistice Centenary Grant Program. Thanks to these grants, scores of local schools will also be holding ceremonies tomorrow to mark 100 years since the end of the Great War. St Patrick’s College for Girls, which will also honour the Anzacs of Macarthur, promises to be one of the more memorable ones. The ceremony was organised by the school’s history club, who have been working since March on the decorations and videos. There are 100 students in the history club; the school’s total enrolment is about 700 students. St Patrick’s College will also pay homage to the four World War I memorials in the old Congregational Cemetery next door to the school in St John’s Park Road. There will also be a commemorative olive tree planting. Dr Mike Freelander, the federal member for Macarthur, who will be attending the St Patrick’s and Mawson Park commemoration ceremonies, said Australia’s World War I campaign took a brutal toll on our young nation. “There were more than 60,000 casualties and 165,000 men wounded, gassed or taken prisoner- our story on the Western Front still holds significance in Australia today,’’ he said. “While this day is a significant milestone in our military history, we reflect and remember all of those men and women who have served our country. 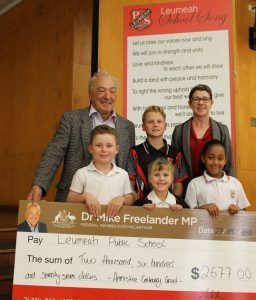 Dr Freelander also visited local schools recently to present them with their Federal Armistice Centenary Grant Program money, pictured above.